Building a community center that would serve a city as diverse as Woodburn is an all-encompassing endeavor – and a pricey one at that. City planners and area architects have been gathering input from various individuals and community groups as they map out tentative plans for center that suits all. 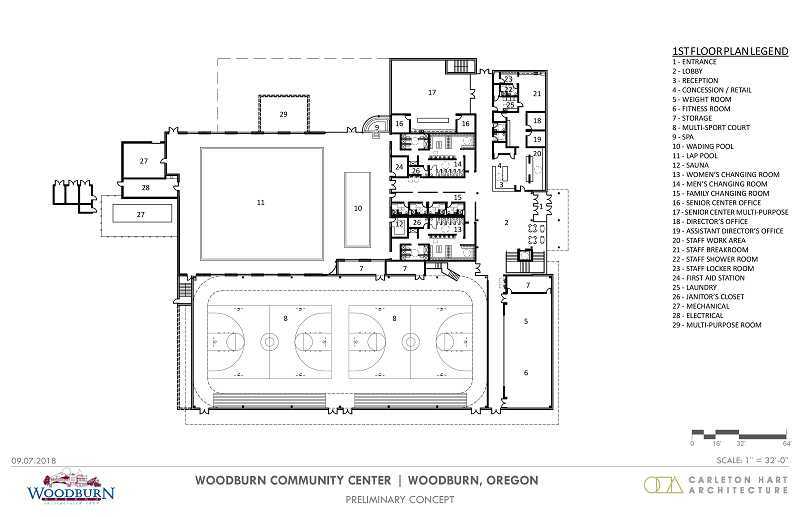 The vision is essentially a major expansion to the Woodburn Aquatics Center, unfolding with numerous, sundry features such as basketball courts ringed above by an indoor running/walking track, a senior center office and multi-purpose room, spa, warming kitchen, weight and fitness rooms, various changing rooms and even a concessions or retail area. The mix is modeled into a two-story structure built around the current aquatic center, which would likely undergo significant improvements through the process. 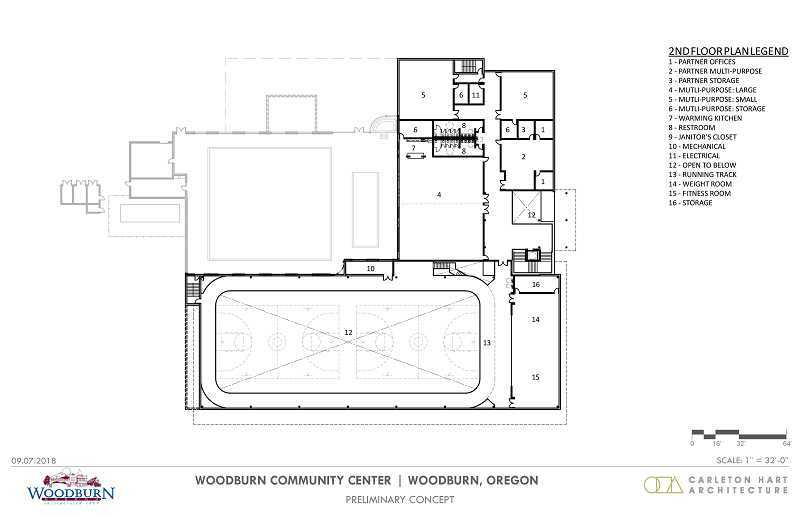 Assistant City Administrator Jim Row and Carleton Hart Architects planning and design professional Martin Segura presented the Woodburn City Council with a community center update on Monday, March 25, while several members of the community added some thoughts. 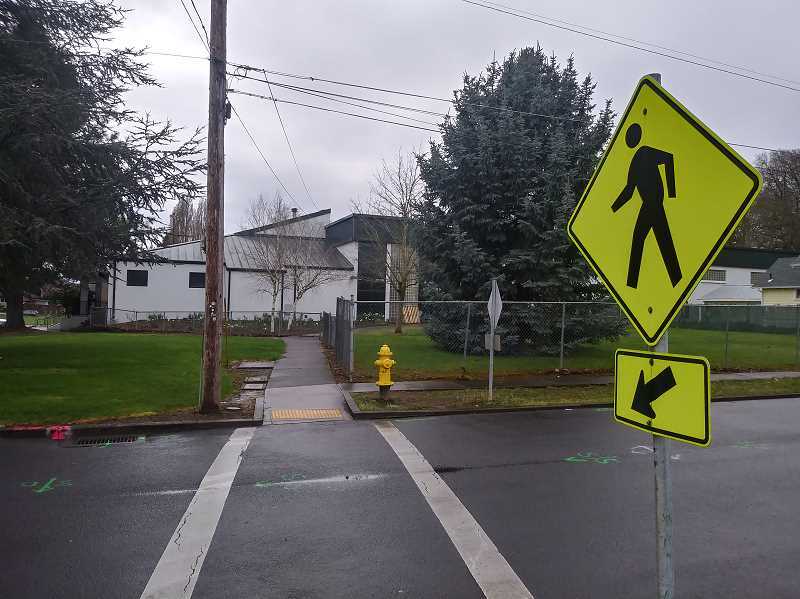 The latter input included folks affiliated with Woodburn Senior Center, Woodburn Downtown Association and Woodburn Parks and Recreation Board. "We looked at wrapping that existing building with new functions," Segura explained to the council, displaying pair of blueprint sketches depicting each floor. 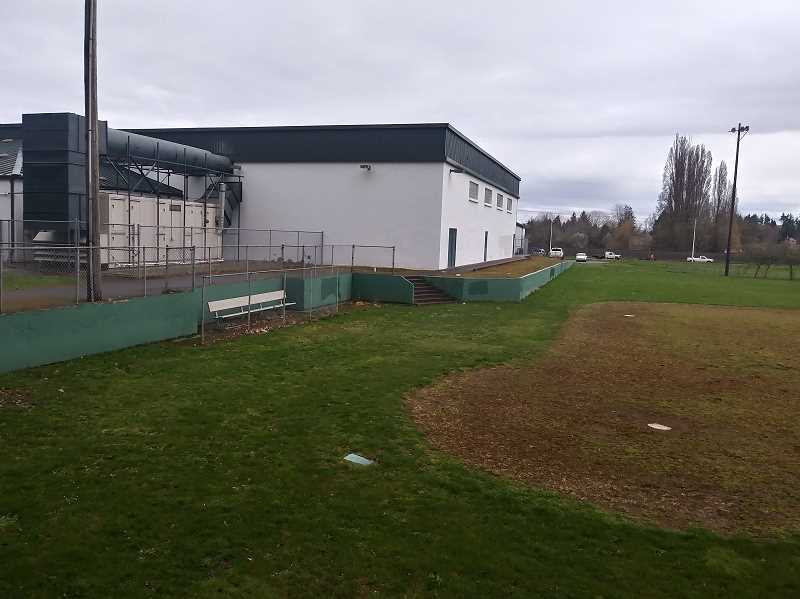 The planners also broke down cost estimates: changes to the existing building, $1,215,315; new addition estimate, $22,787,238; site work estimate, $2,818,583; total construction, $26,820,583; soft costs $6,705,145, bringing the total estimate to $33,525,728. Row described soft costs as everything that is not a direct construction expense, including: architecture and engineering design, furniture, fixtures and equipment, permits, such as DEQ, building, plumbing, mechanical, electrical; system development charges; insurance. Row also acknowledged a touch of sticker shock with the $33.5 million total. "It's a bigger number than what we came into this process expecting," he said. "It's a significant project." The planners saw the project grow several fold as additional input was received. Row said they worked the plans to accommodate pretty much everything they heard. In November of 2017 the city purchased property immediately north and west of the center as part of the community center vision. In the summer of 2017 the city received $1 million in lottery revenue bonds from the Oregon Legislature dedicated to the project. An ongoing feasibility study was expected to update the project cost when completed, but the most current estimate at that time was $11 million. A feasibility study conducted more than a decade ago examined expanding the aquatic center in conjunction with building an arts and culture community center in Legion Park. The cost estimate then was $8 million for each project. The city determined that one project at the aquatic center was more feasible. However, the recession tabled plans. Row said if the funding plans called for a bond to be placed before voters, and if the bond was the sole funding mechanism for the new community center, it would pencil out to about $240 a year for the average Woodburn homeowner; that average is estimated at an assessed home value of $136,000. It would be a 20-year bond. But he also said the funding strategy has not been mapped out, and other potential sources of financing are being explored. "This concept plan will serve as kind of a starting point for the detail design process," Row said. "Once we actually sit down and start going through that process, we may identify things like that where maybe we have undersized storage or we need additional storage. Maybe even the orientation of the ball courts doesn't make sense; maybe we need to flip them around a little bit. "This is just kind of a jumping off point. The planning process is very extensive." Another factor in the mix is operations cost, as the planners explained that the larger, multipurpose facility will require significantly more resources to operate than the current aquatic center. Anthony Veliz, president of the Woodburn Downtown Association, urged civic leaders to explore the wealth of grants, benefactors and other funds a community can seek to succor this type of endeavor. "Woodburn has benefitted greatly, for decades, because of geographically being a rural community; the diversity of the community; the economic situation of the community; after school programs," Veliz said, noting that there is a list that itemizes various grants programs in the city have receive over the years. "I don't see that going away." He also suggested that the creation of the right type of non-profit could possibly generate most, if not all, the funds needed to build the structure. He advised examining other such projects, like the Kroc Center in Salem, to realize how they were funded. Woodburn Parks and Recreation Board member Ricardo Rodriguez recommended keeping Latino residents well informed about the project since they represent many voters, a community that enjoys recreation and one that would be especially amenable to a facility that affords more options during winter months and inclement weather. "A big bloc of voters are the Latino voters," Rodriguez said. "We have to attend to that; help them understand what a great project this is… As long as we help the entire community understand this project…we will have a chance. "We want to have something like that, we don't have something like that here," he added. "Every other (comparable) city around us has a community center, but we don't." A representative from Woodburn Senior Center, Connie Lum, also addressed the council on the topic, urging planners to consider the seniors in the mix as they also represent a voting bloc. City Administrator Scott Derickson stressed that the estimates presented are not locked in, and that further, more refined plans and potential funding sources will mean different cost estimates, either higher or lower. "These numbers are very preliminary and will change; these numbers are not numbers you should hang your hat on," Derickson said. 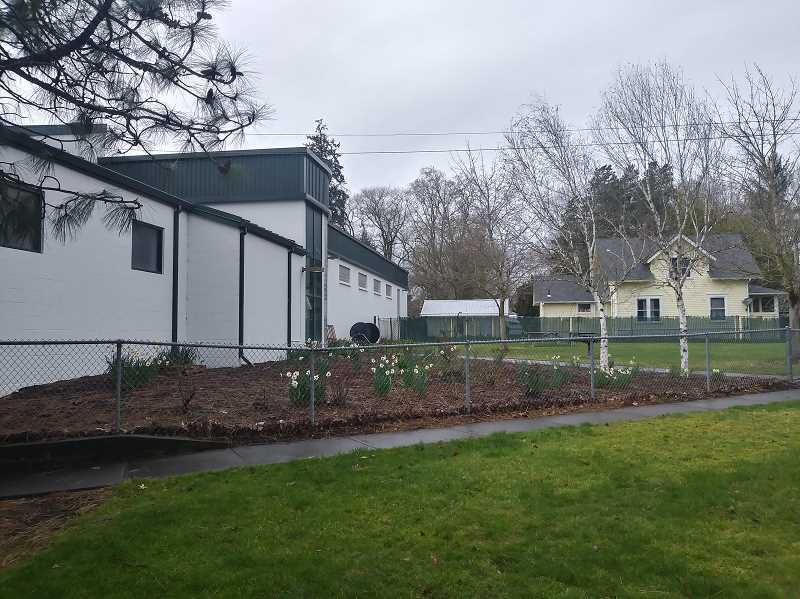 Woodburn had a community center decades ago, but a number of issues, including parking, noise complaints and maintenance costs, ultimately shut it down. Bond measures aimed at constructing a replacement were floated in the late '90s and early 2000s; both voted down. Community center advocates citde that Woodburn is one of the few cities of its size without a community center.